The Lake Lonely Trails are located at the Saratoga National Golf Course and are an easy walk through woods, wetlands, and open fields. The jewel of the golf course’s trails is a lake overlook that lies at the end of the 1/2 mile southern trail, supplying visitors with a beautiful view from the Lake Lonely northern shore. Here, users can also enjoy a platform viewing area to rest or enjoy a picnic lunch. The trail is open year round and is perfect for young children or those who prefer shorter hikes. 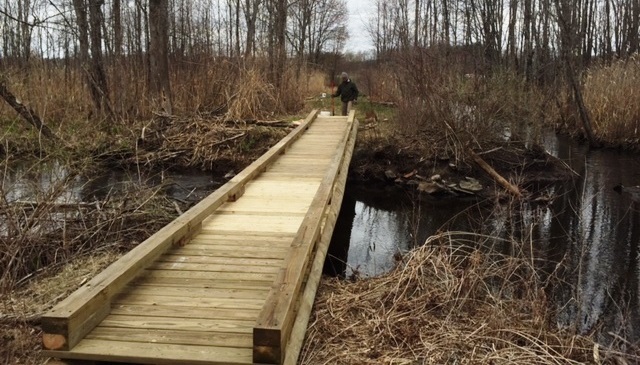 The Saratoga National Golf Club’s Lake Lonely Trail is the result of a partnership between the Open Space Project (now Saratoga PLAN) and the course developers. Since the course’s inception, developers have been generous in donating land for easements and trails. Saratoga National Golf Club is located on Route 9N (Union Avenue) about 1 mile east of the Northway, I-87 (exit 14). A special parking area for the trail is located on Union Avenue just east of the Golf Club entrance. Look for the large white pillars and a black gate. The trail starts by going through the gate and following the path around to the left. Saratoga PLAN holds a 136-acre conservation easement that protects the wetlands that surround the golf course and lake lonely trail.